How to Fill OMR Sheets ? 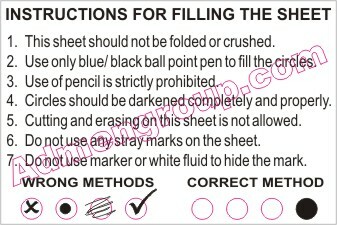 While the instructions mentioned here are followed for filling OMR sheets that will be evaluated using any OMR software or OMR machine, the working of Addmen OMR software, in specific, is not bound by these limitations. You can customize the Addmen OMR software to accept half-filled bubbles, by adjusting the sensitivity of the software accordingly. The OMR reader software’s reading process remains unaffected by dirt and scratches. Use of whitener does not hamper Addmen OMR software’s reading process. OMR answer sheets are used for conducting objective tests containing multiple choice questions with bubbles for marking the answers. These are essentially technical documents that are checked and evaluated by the OMR software. These sheets are designed based on technical parameters and dimensions which the software relies on to read them. Not all papers that contain bubbles or checkboxes can be referred to as OMR sheets. OMR sheets contain index points on all four corners of the sheet, which the software relies on to calibrate the sheets and effectively evaluate them. And special care must be taken while filling these sheets, in order to render them fit for automatic evaluation and to avoid rejections. Use black or blue ball point pens, and avoid gel pens and fountain pens for filling the sheets. Darken the bubbles completely. Don’t put a tick mark or a cross mark where it is specified that you fill the bubbles completely. Half-filled or over-filled bubbles will not be read by the software. Never use pencils to mark your answers unless specified, in which case just stick to HB or 2B pencils only. Never use whiteners to rectify filling errors as they may disrupt the scanning and evaluation process.